This is a common and often asked question, but one that cannot possibly be answered as a generalisation. One of the most confusing decisions for a back pain sufferer is which treatment to go with to relieve them of their pain. Everyone they speak to has a different opinion based on what worked for them and the fact that there are literally dozens of options out there, all making similar claims, doesn’t help to make the decision any easier. The most often resorted to treatments are chiropractic, physiotherapy and massage. This is not because they are necessarily better than the other options available, but more because they have been around longer and are more established throughout the world. However, the cost of these treatments are usually come straight out of the sufferer’s pocket who invariably and understandably wants and needs fast results. Sufferers on a limited budget prefer to see a doctor and go down the rebated drugs and surgery route. Most pain sufferers don’t really understand exactly what the different therapies can do to fix their pain. Often they just go on faith because a friend of theirs has recommended a specific treatment. Naturally they expect quick results and usually only stick with something if they are making progress or if the therapist is very good at convincing them that treatment will take more time, usually just to keep them coming. 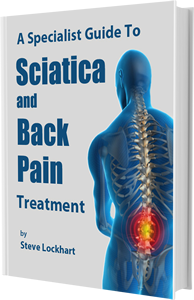 The reality is that everyone is different and the patterns that each individual’s body has developed which have caused back pain are never just because something ‘went wrong’ in an isolated area of the body. The responsiveness of one sufferer’s tissue to a stimulus may be very different to that of another sufferer and this is why a treatment that worked for a friend may not have provided any benefit for you at all. There are so many variables, and because each person is unique and different, it can vary completely from one person to another. Strength is one of the biggest factors to consider when one looks at how far a sufferers problem has spread throughout their muscle system. The more naturally strong a sufferer is, the more protected their joints are against movement and irritation that can affect the discs and nerves and cause pain. Strength is usually not something a sufferer can work on when they are in acute pain because strengthening exercises often just irritate the pain. However, strength does protect your body against pain. How you use your body throughout the day can also have a bearing on whether a treatment for pain will have any lasting effect or not. If sitting down causes you pain, but that is what your job involves all day, then chances are that treatments like physiotherapy and chiropractic will not offer much relief because they are traditionally slow to get results. It is often a case of one step forward during a treatment and one step back over the next day or so. One of the most noticeable ways a person can prepare their body for treatment is to make changes within their body starting with one of the most important contributing factors to treatment success – diet. The right diet makes a body supple and naturally strong while the wrong diet leaves a body weak stressed, weak and tight. This is one of the reasons I stress the diet aspect so strongly in my books and treatment programs – because I know from experience how greatly it impacts treatment, the outcomes and success of any treatment and the level of pain a sufferer experiences. Often times, a more concentrated treatment regime is required. The annual Healing Conference I run in Thailand treats back pain sufferers intensively over a two week period. One of the patients who attended my most recent conference is a good example of someone who would have struggled even with weekly massage sessions, especially when trying to fit their normal life in and around those treatments, with little to no exercise. It would take longer with weekly sessions to get the same incredible results that we did in Thailand where their diet was very good and they were able to commit to daily exercises to support the bodywork we were doing. In addition, not being at their desk for 8 or more hours a day meant we could make about a year’s worth of changes to their body in just two short, but intense, weeks. The reality is that no-one’s back pain is exactly the same as a another sufferer. That is why hand out sheets of exercises that patients usually get will do very little to provide relief from pain. Any therapist you see needs to look at all the aspects I’ve mentioned above as part of a personally tailored rehabilitation program that is put together after an accurate assessment of your body and lifestyle. The better condition your body is in before you commit to a treatment regime, the better your chance of treatment success and achieving long lasting results in the shortest possible time. So, if a family member or friend recommends a certain treatment or therapist based on results they have achieved, I would suggest that you take the above into consideration and ask yourself how similar you and your friend are with respect to lifestyle, job, diet, exercise, cause of your original problem and even your emotional state. This should give you fairly good idea of whether it is worth investing your time and money on their recommendation. Certainly pressure on the circulation and stress causes the body to age and deteriorate faster than it would otherwise do. This is why I recommend adopting the self treatment regime which is a holistic program dealing with lifestyle habits as well and treating the pain. There is a lot that one can do for themselves that you will never get told by your doctor or conventional therapist and I belive everyone should take a certain amount of control with this. If you don’t take care of your body where are you going to live? HI STEVE, JUST WANT TO SAY THANKYOU SO VERY MUCH FOR TAKING THE TIME TO CARE ABOUT MY PAIN. ALL THE TECHNIQUES AND INFORMATION YOU HAVE GIVEN IS BENIFICIAL AND HELPFUL. I ESPECIALLY LOVE THE TWO BALL TECHNIQUE, FINALLY MASTERED IT WORKS GREAT. ANY HELP YOU HAVE GIVEN WORKS GREAT. ONCE AGAIN THANKYOU FOR CARING! !